Russia may not be the first to come to mind when you think of a food destination, but the country has plenty of delicious traditional dishes to try. 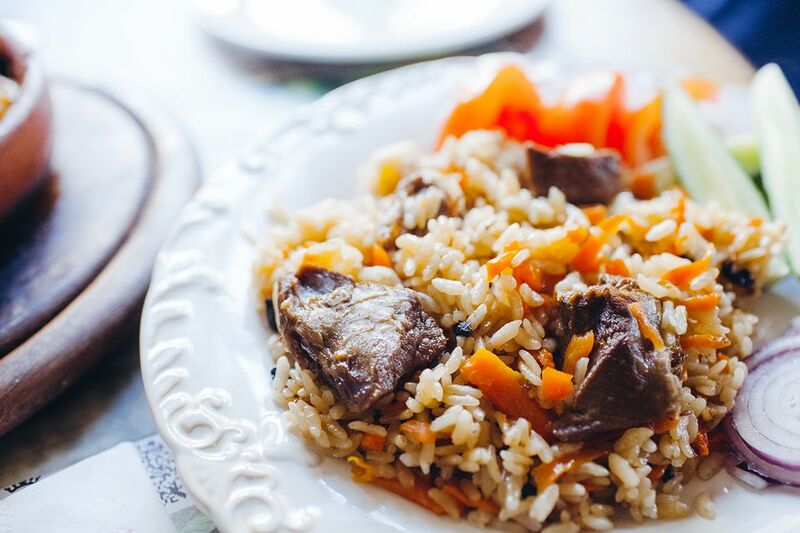 Visitors to Russia are often surprised at the variety and flavors of Russian cuisine, which is influenced by Russia's connection to Europe, Asia, and the Middle East. The most classic Russian recipes are made of veggies and wheat, such as soups, porridges, and stuffed dough. Borscht is a beet soup that originated in the Ukraine and was quickly adopted as a Russian specialty as well. Beets may seem like a strange base for soup to many Westerners, but there are plenty of reasons that this hearty soup is one of Russia’s most famous dishes. It is full of meat and sautéed vegetables, including cabbage, carrots, onions, and potatoes. It can be served hot or cold, and is best served with a dollop of fresh sour cream on top. Shchi is a typical cabbage soup made from either fresh or fermented cabbage. While different recipes call for various ingredients, shchi often contains potatoes, carrots, onions, and possibly some type of meat such as chicken. The cabbage can also be replaced with sauerkraut, which is then called sour shchi. Solyanka is a thick soup that is plentiful enough to be a meal in itself. This soup is made with various types of meat, including sausage, bacon, ham, and beef, as well as vegetables such as cabbage, carrots, onions, and potatoes. Chopped pickles and the traditional lemon slice garnish play an important role in giving this recipe its sour flavor. It is often also made with fish and pickled cucumbers. If you like seafood, try ukha, a fish soup with a clear broth. Many different kinds of fish can be used to make this soup, including bream, wels catfish, northern pike, and ruffe. You may have already heard of pirozhki (also known as piroshki or pyrizhky). These little baked or fried puff pastries are packed full of potatoes, meat, cabbage, or cheese. The stuffed pockets are popular all around Russia, and Ukraine. Pelmeni is the national dish of Russia. They are pastry dumplings are typically filled with minced meat and wrapped in a thin, pasta-like dough. They can be served alone, slathered in butter and topped with sour cream, or in a soup broth. Definitely a favorite in Russia and Eastern Europe! Blini or blin is a wheat pancake rolled with a variety of fillings: jam, cheese, sour cream, caviar, onions, or even chocolate syrup. It is Russia's equivalent to a crepe. At any restaurant where you aren’t sure of any of the other dishes, blini are always a safe bet. Blini are such an important part of Russian cuisine, a festival called Maslenitsa celebrates the beginning of spring with them. Russian kebabs are called shashlyk or shashlik. Like any kebab, they consist of cubed meat and veggies grilled on skewers. Beef stroganoff consists of strips of beef in a creamy sauce with mushrooms or tomatoes, often served with rice, noodles, or potatoes. This recipe has a long history, and many variations for its preparation exist. Caviar, or ikra, is really something to get worked up about in Russia. Briny and sharp, it is often served on dark, crusty bread or with blini, which are like pancakes or crepes. Caviar on buttered bread is a popular zakuska. You can expect to find sour cream, or smetana, accompanying almost any Russian traditional food—with crepes, in soups, and even sometimes in dessert. This sour cream is fresh and often melts into any warm dish, adding to its distinctive flavor. One of the most famous stereotypes about Russians is that they love their vodka. Expect to find many varieties of Russian vodka, such as Russian Standard Gold, Mamont, Moskovskaya Osobaya, Kauffman, and Beluga Noble. Tea, mineral water, beer, and soda can also be found on Russian beverage menus. Kvass is a refreshing fermented beverage with slight carbonation. Although it has a very slight alcohol content, it is not considered an alcoholic beverage. It is made from black or regular rye bread or doug. Russians love ice cream, called morozhenoe. It is common to find it on many restaurant menus with a variety of toppings​ to choose from—like fruit, nuts, or chocolate. Paskha is a festive dessert that is commonly made around Easter in Eastern Orthodox countries. This sweetened cheese cake dessert is decorated with Christian symbols as a part of the holiday feast.